Poliedrica s.r.l. 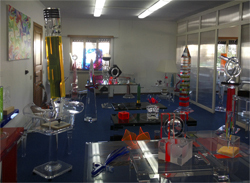 High quality plexiglass (lucite) works and furnishings. 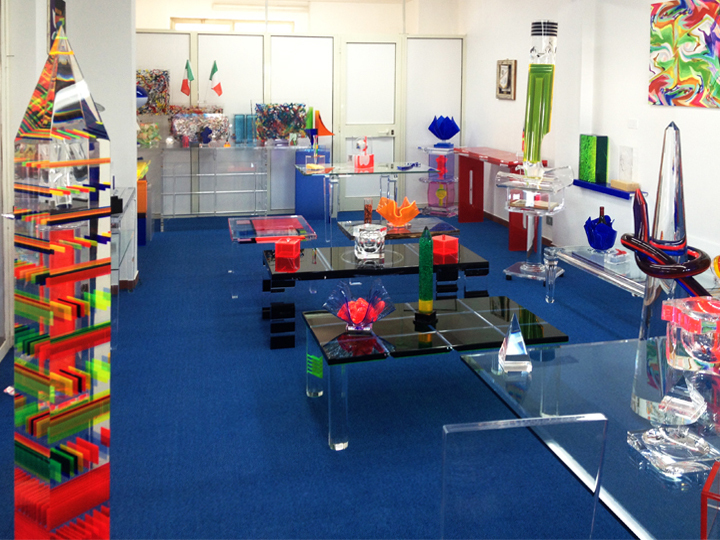 It is back in the far 1973 that we started our experience in processing cell cast acrylic (PMMA: Polymethyl methacrylate also known with the commercial names of: plexiglass or Plexiglas, perspex, Altuglas, Lucite, etc…) is a charming and ductile matherial, full of light, main protagonist of our creations. We are in Pomezia, near Rome, central Italy. Our protuction comprehends furnishing and interior design in plexiglas : dining tables, coffee tables, chairs, consoles tables, lamps, bookcases, shelves, semi-finished acrylics, rods, holders, displays, manufactures ,as well as Artistic Design and artistic works visible in our new collection. We base our work on projects realised by our designers or we can customize them according to ideas, and possibly drawings, of the clients. The high quality of our products, entirely MADE IN ITALY, allows us to be proudly present in the Italian and foreign market. Some items visible in the pictures of our showroom, have been realised on the design by some designers or artists we collaborate with, thus not for sale nor for production.